Hmm…that “Miss Melee” looks familiar…you may recognize her from Boxx Wrench’s guest page! There are just a few days left to join the Physical Copies tier on the Miss Melee Patreon to be entered into the proof copy raffle! And not just that, but we’re only one Inside Scoop (or above) Patron away from unlocking the issue 1 ultra in-depth inside scoop for the Inside Scoop tier! We’ll also have some super sneak peeks of issue 6 coming very soon, exclusively on Patreon, so check it out! I’m starting to think he knows. I’ll grant you that he has more reason to recognize the connection than any other single person. It may be something he hasn’t even thought about. I won’t assume he knows, but I’d guess that, if he chose to investigate Miss Melee’s secret identity, he’d trip to it pretty quick. The look he gives her in the third panel. We still don’t know if these pages are canon. If they are, I lean strongly toward agreeing. Although, if he does know, I’m wondering why he hasn’t done something about getting his daughter some protective gear (maybe he wasn’t aware she was going into action yet). We know Jan doesn’t think he knows. 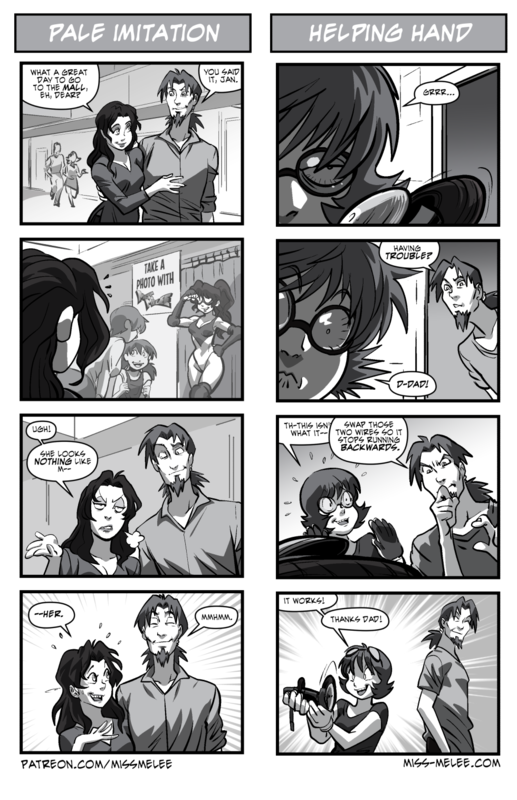 More than that, the first section is a call-back to Issue 1 almost exactly, down to most of the expressions (check it out if you don’t believe me). Probably realises Jackie would of taken after her mom and become a heroine anyway; at least she can learn the ropes with Janice and be safer then on her own.